Last night, I had an epiphany. I realized that the calendar said March, that Camp NaNoWriMo is only a few weeks away, and I don’t have a novel planned yet. All of the novels that are currently bouncing around in my head need a whole lot more research before I’m ready to get them down on paper. I’ve been slacking on getting my research reading done, and there are too many books to read and skills to learn before the end of the month. I’ve put myself in the position of needing to come up with a novel in a month. Technically, I’m not starting from scratch. I have a premise and the main character’s name. I have a lot of plotting to do. I’ve decided to grab my Writing the Breakout Novel Workbook off my bookshelf, and I’m going to be picking out exercises to do each day between now and then. I may even make up my own exercises to throw into the mix. The goal is to have know a whole lot more about this story and its characters by midnight on March 31st. Part of me is hopeful and excited about Camp. I’ve had a handful of really good experiences in the past when I didn’t have too much of a plan. I’ve actually been more successful in those cases than when I’ve planned out each chapter. Maybe this is actually a good thing. Unfortunately, that part of my brain is quickly being drowned out by the panic that I have no idea what I’m going to write. I going to hope for the best, plan for the worst, and cross my fingers that I don’t go crazy by the end of April. Are you preparing for Camp NaNoWriMo? Or have you been prepared since November? 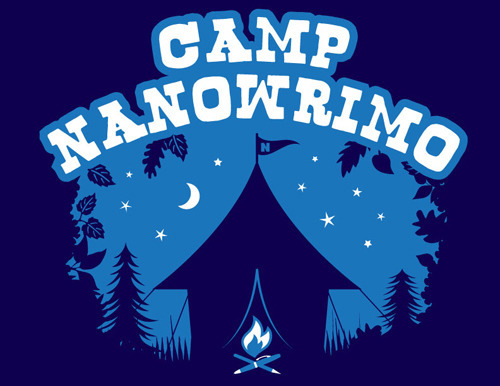 To find out more about Camp NaNoWriMo, or to sign up to write your own novel, click here.